Santa came again and dropped of a whole bunch of glass and a lens press. I am now learning to use all of these and the results are variable. I got some wierd color combinations and some lima bean looking beads but I think I am on the right track now. For now. 1. CiM pheonix, as unstruck as I could make it. I did make this on the same mandrel as bead 2 and flashed it in the flame a few times, but I wouldn't have thought it would have struck to the extent it did. Only around the holes is it a peach color. 3. being taken over by SiS. I knew I would like this combination. Next lesson: learning stringer control. 4. with DH aion2, encased in (I think) CiM clear. I was hoping for that orange and purple thing, which I will probably never be able to duplicate with a more readily available color. I got grey. 5. with DH triton, encased and mashed with more success than I thought. A little overfill on the press but I think I got the general shape the bead has to go in right. Now I have to figure out how to encase so I don't get all that clear on the thin edges. 4. over CiM tux, melted in, reduced, and encased in kelp. I like this bead. 6. tux with silver leaf, encased in kelp. The kelp went semitranslucent on this. 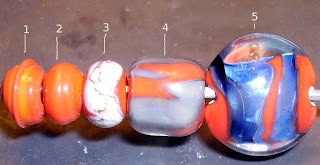 Not my favorite bead. 7. tux with silver leaf, encased in a thinner layer of kelp and mashed. A bit better. Note the brown reaction. I made a few crocus unique beads, I forget which unique, I'll look it up, and decided I had to try it against the original crocus, which I think I like better. Or I like the beads better, at any rate. The original has very few, if any color reactions that I've found yet, although it was hard to reduce old faithful triton. Here are the beads. 3. encased in clear. Fritpedia suggested encasing it in Reichenbach clear, which I do not have, so I tried CiM clear. It's not doing anything for me. I'll have to try it with the Reichenbach, if I get some. 4. With DH triton. Note the lack of silver color on the triton. Ignore the misshaped lentil. 5. with triton, reduced and encased. This turned out a bit better. 6. with silver plum dark scrolls, finished high in the flame. OK.
7. with copper green. No reaction. What? a color that doesn't react to copper green? Here is another color I had to try, seeing that spring is almost here (what a laugh) and I need a pick-me-up. These were made with Vetrofond banana cream odd lot. 1. plain and unadorned. What a nice sunny color. 2. encased in CiM clear. 3. with DH triton stringer reduced and encased in clear. I didn't think I would like this, since thinking of this and silver glass did nothing for me. I am glad I tried it, because it's my second favorite of the bunch. As far as color combinations go, regarding technique, did I mention I sock at encasing? 4. with sis. What was I thinking? I'd blame the drink but I was sober. I am noticing that encasement and color reactions lighten this glass. Interesting thing to know. 5. with plum silver dark, finished high in the flame. Nice contrast, but I don't know if I would want a set of these. 6. with effetre turquoise 236. Less of a grey line than I was expecting. I like this combination. 7. with copper green. Again, not a whole lot of reacting going on. Pretty combo. 8. with EDP. My favorite combo. I didn't think I would like it, again, but I'm thinking pansies.